MANILA, Philippines – CityMall Commercial Centers Inc. (CMCCI), the mall development arm of DoubleDragon Properties Corp., is planning to build a second community mall in Bacolod City. In a disclosure to the stock exchange, DoubleDragon said CMCCI secured a joint venture for a 1-hectare prime commercial lot in Mandalangan, Bacolod City, where the community mall would be built. 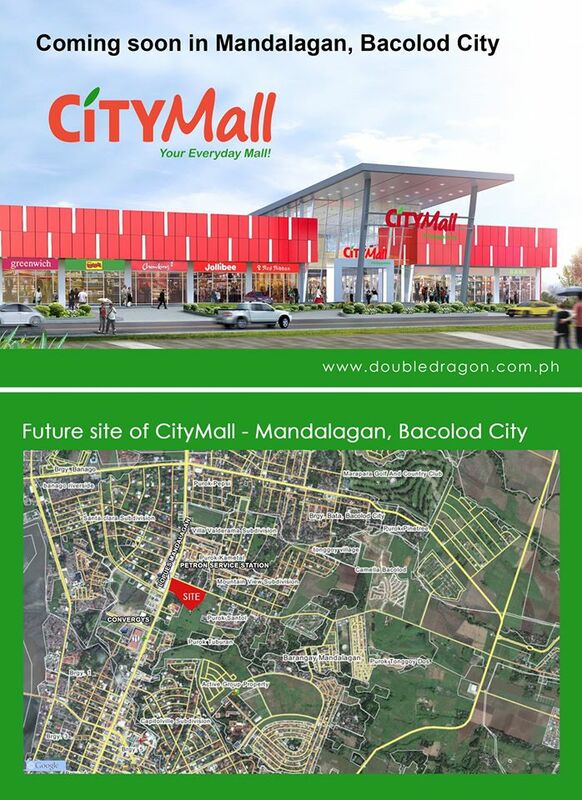 The CityMall – Mandalagan Bacolod will be located along Lacson-Mandalagan Street, near public market, churches, hospitals, banks and residential subdivisions. DoubleDragon said the property is the 15th site secured by CMCCI for its CityMall chain. A CityMall outlet is a one-floor strip mall with 5,000 to 10,000 square meters of retail space. “(This) puts the company on track to meet the goal of completing its first 25 CityMalls by end of 2015 and a total of 100 CityMalls by 2020, all in prime and strategic locations around the Country,” DoubleDragon said. DoubleDragon sees strong growth in Bacolod, citing the city’s fast-growing information technology and business process outsourcing sectors. “The whole DD team continues to be determined on its near-term goals of reaching 1 million square meters of prime leasable spaces around the country. We believe that this will provide the company with both a strong recurring rental income and a string of valuable appreciating assets,” the company said. CMCCI earlier said it has secured a 1.1-hectare prime commercial lot along Araneta St. in Bacolod City to build the CityMall-Goldenfields Bacolod. The project is part of a joint venture involving the redevelopment of a 6-hectare mixed-use complex to serve the north of Bacolod.